Snapshots of God’s surprises during our short-term mission trips. 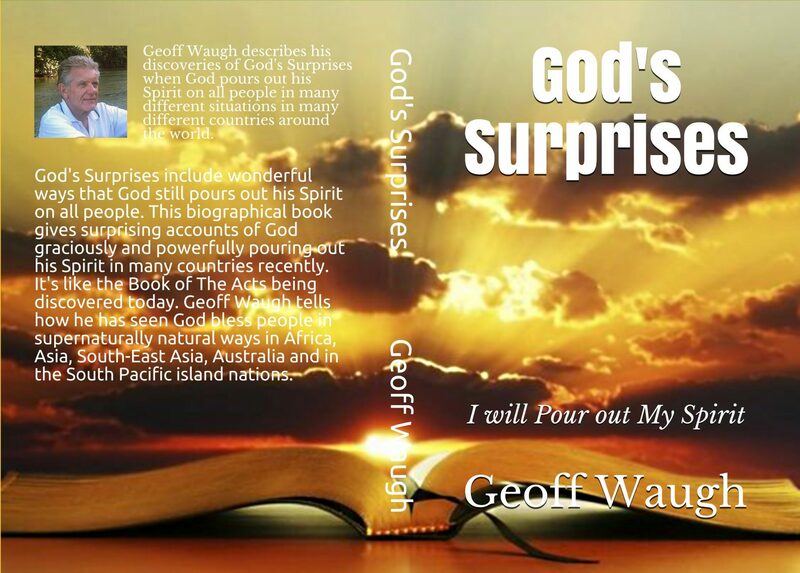 God’s Surprises summarises revival events in 20 countries. It’s a brief summary of information in my books Journey into Mission (most detail) and Journey into Ministry and Mission (condensed autobiography). Details of mission adventures in 20 countries, given in historical order. It includes early days as a single and then married teacher in Papua New Guinea and teaching in Australia and other countries. “Can I take some bread home?” asked a tattooed young man at our communion service in the slums of Nairobi in Kenya, East Africa. God’s Spirit had prompted me to buy a few loaves of bread, bottles of drink and plastic glasses for the congregation. We shared real drink and two loaves of bread together among 30 people in their corrugated iron shed where I was the guest preacher. “It’s your bread,” I answered. “You decide.” He quickly shoved a handful of bread into his pocket. Then most of the others did the same. Two weeks later, Frank, the young pastor, emailed me: “I’ve visited the slum homes of those people and they are still eating that bread. It’s still fresh.” Apparently God multiplied it. Frank and his wife Linda then offered free bread and drink each Saturday for hungry, skinny slum people, usually catering for about 50 people. Sometimes many more turned up but they always had plenty. Apparently God kept multiplying it as needed. A young pastor in Ghana in West Africa invited me to hold meetings there. So I arrived with three others from Brisbane during our college break in July, forgetting it was monsoon time in Ghana. We flew into a deluge of rain on the Monday. Our hosts planned night meetings in the market from Tuesday, with morning teaching in a local church. “Can we hold the night rallies in the church?” I suggested. “What about the rain?” I asked. “God sent you, so he’ll do something,” they responded, full of faith. We drove for over an hour in pouring rain from Accra, the capital, to the town of Suhum in the hills for our first meeting on Tuesday night. The heavy rain had flooded the power station there so the whole town was in darkness. We prayed earnestly, asking God to take over. Heavy monsoon rains began again the day after our meetings ended. A friend of mine worked with the United Nations in Nepal. He loved to help and support pastors and leaders there. We visited him many times and I spoke at pastors and leaders meetings in Kathmandu, in West Nepal and in East Nepal. Some of those pastors walked for two or three days across the high ranges just to attend. Their churches are saturated in prayer. I prayed in their “Power House”, the upstairs prayer rooms of their church in Kathmandu. Those small upper rooms, open 24 hours a day, had many people going there to fast and pray, sometimes for many days. We saw God’s Spirit move beautifully and powerfully in those meetings. Many were filled with the Spirit and healed. I heard a young man from one of their church bands praying eloquently in beautiful English – but he cannot speak English. They pray for one another with strong faith, expecting God to save, heal, deliver and anoint them. The dedication of those Christians impressed me. Most of them have been imprisoned for their faith many times. One young pastor conducted a Christian wedding which infuriated relatives so they complained to the police and he spent a month in prison for disturbing the peace. Our host had been severely beaten while in prison. Two young evangelists were shot to death when we were there. They had returned from Bible College in India and were accused of spying. God gives those Christians amazing peace and joy amid the persecution, just as in the Book of The Acts. Our team visited Grace Bible College in New Delhi founded by Dr Paul Pilai. Paul had stayed in our home in Brisbane when he visited Australia. He was converted after a young Christian girl prayed for his healing while he was very ill in hospital and he recovered miraculously. He told us how his students and teams started new churches in villages and towns. They often faced angry opposition. One fanatical group burned their meeting tent and attacked them, hitting them with clubs, trying to kill them. They broke Paul’s arm and burned the tent. Suddenly some handsome Indian men surrounded Paul’s team and miraculously moved them away to a safe place nearby. The team could see their burning tent in the distance. Those angels told Paul that God would send him back there. A few years later they were invited back and started a church there in a home. Grace Bible College, the largest in India with around 600 students, trains people to evangelize and plant churches, especially among unreached peoples. Their graduates often face persecution and some have been martyrs. What a humbling privilege it was to pray with the staff there and speak to the crowded hall full of such committed students. I taught on revival at a seminary in Manilla in the sweltering heat of the Philippines. An assignment I gave my M.Th. students was to report on revival and miracles. One pastor, who was also a police inspector, reported that a church he visited sent groups of young people to sing and speak at hospitals and nursing homes. One of those teams held monthly meetings in a mental hospital. The staff said that their patients may not understand much, but those patients did enjoy the singing. Over 40 came to the first meeting. The team offered to pray for anyone who would like prayer. They prayed personally for 26 people. The next month when the team returned, all those 26 had been discharged and sent home. I visited China with a student from college. His parents worked there. The woman pastor-evangelist of a house church invited us to her church in a high-rise unit. The young man who met us at the gate could speak English. He feared that the security guard might ask awkward questions, but as we walked in around 7pm, the guard had his back to us, talking to someone else. When we left after midnight, the guard was gone, probably sleeping. Around 30 people sat on the floor and sang softly in worship. We spoke and then found that no one would leave until we had prayed for them personally. That took a while! They were happy to slip away one-by-one, just as they had come. Most were new Christians who believed because a Christian prayed for their healing. They believed in prayer and miracles just as in the Book of The Acts. Their simple, strong faith and humility moved and challenged me deeply. We visited Elcho Island in the north where revival broke out and spread through Aboriginal communities all across northern Australia. We invited a team from Elcho Island for a Pentecost weekend in Brisbane. Two dozen came! They told us about the revival and prayed for people after each meeting that weekend, just sitting on the carpeted platform floor, aboriginal style. That revival began after aborigines on Elcho Island prayed desperately for revival amid increasing crime, drink and drugs. The night their pastor, Djiniyini Gondarra (photo), returned from a holiday they met for Bible Study and prayer in his home. God’s Spirit fell on them as they united for the closing prayer. That prayer and ministry went all night. People were filled with the Spirit, discovered many spiritual gifts, and saw healings and reconciliations. Everywhere their teams went they saw God moving on the people in local revivals. Many revival movements have swept the South Pacific islands. I saw some. God’s Spirit fell on the Law School of the University of the South Pacific just after Easter 2002. The Law School is in Port Vila, the capital of Vanuatu. Many law students were saved and transformed at their open-air rally. Those committed students went on missions to other South Pacific nations and to Australia. Now they are lawyers and leaders. A president of their Christian Fellowship became a Member of Parliament in Fiji. Some of those teams came with me to Pentecost Island in Vanuatu. God has been moving there in unusual ways for a hundred years. Vanuatu people first evangelized the island, one becoming a martyr. A wife of the highest ranking chief returned to life after she died and told them that she had seen God and they should leave their heathen ways and become Christians. Many revival teams have served God there in local revivals. Large numbers repent, are filled with the Spirit, and receive many spiritual gifts including revelations, words of knowledge about hidden magic or sins, and deliverance and healings. God poured out his Spirit on children and youth in the Western Solomon Islands from Easter 2003. They loved to sing and pray daily in the church after school. God gave them visions, revelations, words of knowledge about hidden sins and bad relationships and they received many other spiritual gifts such as healings and speaking and singing what God revealed. God revealed to a young boy the name of a man who stole a chain saw from the timber mill. A church member had been wrongly accused of that crime and sacked. He was reinstated after the man who stole it was confronted and confessed. A mother asked me what it meant when her young boy had a vision of Jesus with one foot in heaven and one foot on the earth. I immediately remembered Matthew 28:18 – All authority in heaven and on earth has been given to me. We saw God touch around 1,000 youths at a National Christian Youth Convention in 2006. One night at the convention they responded, running to the front of the open-air meeting. For half-an-hour their worship team sang “He is Lord” while we prayed for them. They fell like dominoes. Many testified to healings, visions and revelations. One young man returned to his village that night and found his mother ill, so laid hands on her and prayed for her. She was healed. His brother then asked for prayer and he too was healed. The young man had never done that before. A whole group from the Kariki Islands, further west, saw revival begin in their islands on their return. God moved powerfully in every meeting they held and in their personal prayers. My book Journey into Mission – PDF link – gives more details. You can do that right now – at your computer or with your phone. You could take time right now to pray and seek God, to pray and obey.